Editing may be one of the most challenging tasks for a photographer. Navigating through hundreds of photographs may feel overwhelming and confusing. This two-day workshop will offer guidance and support to participants working in the documentary tradition and with projects that may be complete or in-progress. Participants with work in-progress will greatly benefit from the editing exercises. Régina Monfort will share her holistic approach to create meaningful and responsible narratives. She will work closely with participants, guiding them through the process of editing and sequencing their images and helping them defining their vision in the process. As the photo editor of numerous books, Monfort has a broad experience with weaving hundreds of images into personal, complex and unique bodies of work. 2. Define the core of a narrative, its structure and build a cohesive image sequence accordingly. 3. Understand how images speak to one another through content and/or aesthetic elements. 4. Be responsible & mindful when juxtaposing images. 5. Understand how personal attachments to particular images may not serve a narrative. 6. Work with non-linear narratives. We will begin with a case study showing how hundreds of images turn into a cohesive body of work to be published in book form. Students will work in groups of three editing and sequencing their individual projects. The workshop will be held in English but assistance in italian will always be available. Individual feedback will also be available in French. Participants are asked to bring up to 50 small work prints (13 x 18 cm), as well as a folder with jpegs of those same images at 72 DPI and 1500 to 2000 pixels in longest dimension. – Students work, in groups of three, editing and sequencing their images. – Students continue editing and sequencing their images. – Selected participants to present their final edits in PDF form. 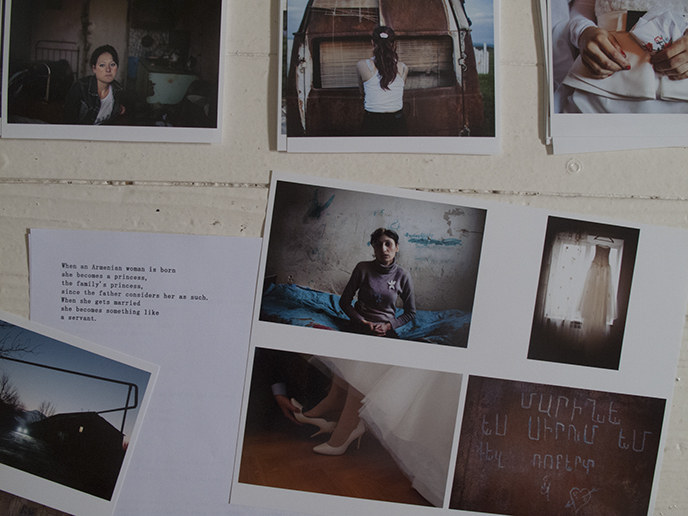 © image above: editing “Princess to Slave” by Anahit Hayrapetyan (2015 FotoEvidence Press). Régina Monfort is a French-born photographer and editor living in New York City. Her photographs has been widely exhibited in the United States and abroad and held in permanent collections including the Brooklyn Museum of Art, The Library of Congress and the Yale Art Gallery. As a photo editor for FotoEvidence, she has worked on a number of books, among them: Daniella Zalcman’s Signs of Your Identity, Marcus Bleasdale’s The Unravelling, and Tanya Habjouqa‘s Occupied Pleasures. Her independent projects include Andrew Lichtenstein’s Mark, Unmarked, Remembered (West Virginia University Press) and Richard Sandler’s The Eyes of the City (powerHouse Books). Monfort brings her formal experience working with Irving Penn and Richard Avedon to her personal endeavors. From 1997 to 2002, she was the US based assistant to documentary film director Jean-Pierre Krief on the series Contacts co-produced by Arte and Le Centre National de la Photographie in Paris. She has taught photography at CUNY La Guardia Community College and Pratt Institute and was a visiting instructor at the School of the Art Institute of Chicago. She is a member of the American Photography Archive Group. A fascination for the human spirit, a love of light, and a strong belief in the ability of photography to illuminate social challenges continue to pave her journey.